Our fabric shoe cover booties are made of 100% spunbond polypropylene, which provides breathability for non-hazardous and low particulate barrier applications. This low-lint, durable, non-woven fabric helps filter particulates for contamination control in critical environments. These shoe cover booties have an ESD-dissipative ribbon with an average surface resistance of 85,400,000 ohms (at 12% relative humidity) and 46,200,000 ohms (at 50% relative humidity), which is within the allowed range between 35,000,000 and 1,000,000,000 ohms (certificate and analysis report available at these links). Each bundle contains 100 shoe cover booties. Thirty (30) bundles are included in a case for a total of 3,000 shoe covers. The data sheet for our ESD shoe covers is available to download here (.pdf files require Adobe Acrobat to view): ESD Fabric Shoe Cover Data Sheet. To receive a no-obligation quote on shoe covers and our automatic shoe cover dispensers, please fill out this form. 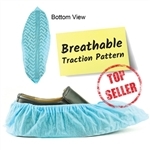 If you're looking for shoe covers with added traction check out our fabric shoe covers with ESD protection and traction.